Toky can be easily integrated with several business apps like CRMs and collaboration tools. Every integration has great features and enables among other things synchronization of events related to inbound and outbound calls and SMS with every connected app. Follow the steps on the right panel. The process can be different for every integration and this is because the particular requirements of every app. 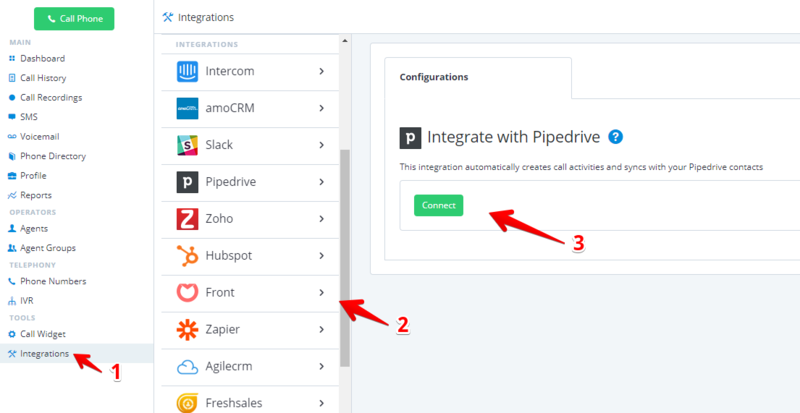 What happens after enabling the integrations? Once the integration is enabled for the first time, the synchronization process will begin and its duration depends on how much records you have. On average, it generally takes between 1 to 15 minutes from start to end. The contacts will sync with Toky but they won't show up in the Phone Directory section of Toky. This is normal and intended to avoid data duplicity between your CRM and Toky. Calls you make won't be logged in the integration if the synching has not finished. There's an integration log where you can see what calls were logged and where. Find it in the tab next to where you configured your integration for the first time. The integration will be available for all agents in your account. You don't need to set it up for each agent. If you want to click to call, you need to be using Chrome and install the Click to Call Extension on each Chrome browser where you want it. Click to Call is not mandatory to have in order to make the integration work. Consider it just as a helper to make your work easier when it comes to typing a phone number and dialing.